editore: Published by J. Jaques & Son. 102, Hatton Garden, London E. C.
stampatore: Published by J. Jaques & Son. 102, Hatton Garden, London E. C.
descrizione: Gioco di percorso di 100 caselle, spirale, orario, centripeto. REGOLE: non riportate sul tavoliere. 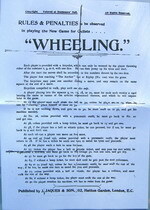 "Wheeling". 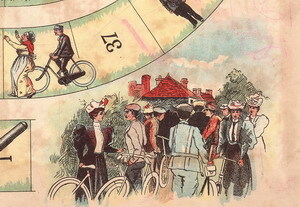 (Victoria&Albert Museum) The game shows the adventures and mishaps that sometimes befall cyclists. 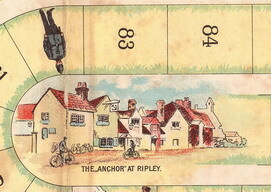 The playing area has 100 spaces, and the finishing one is the Anchor pub in Ripley. Up to eight players can take part, and each has a lead playing piece. 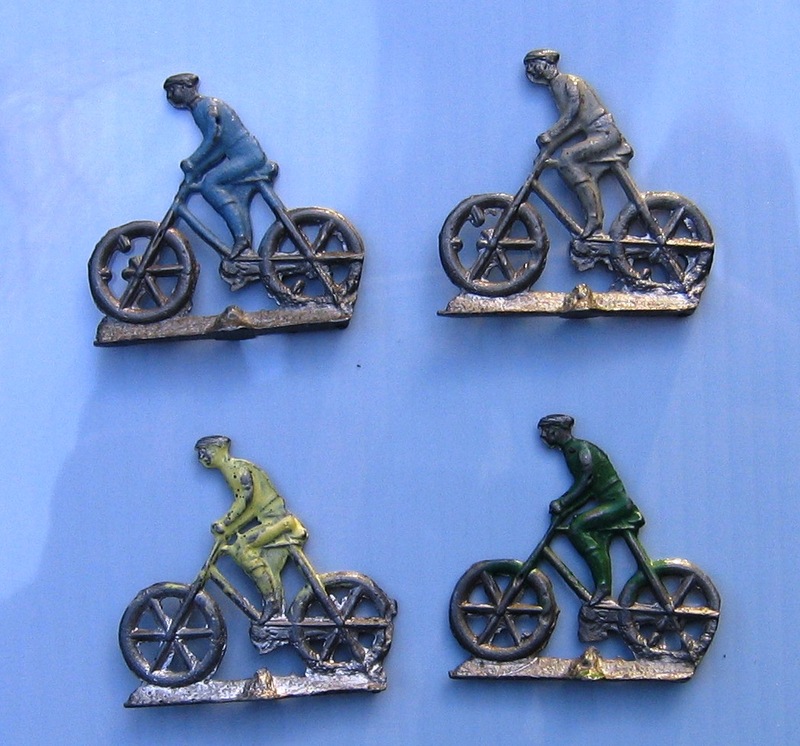 These are in the shape of male and female cyclists and were probably made by Britains Ltd, a company famous for its lead figures. Design: chromolithograph mounted on card; three folds. Artist/maker: John Jaques & Son Ltd. 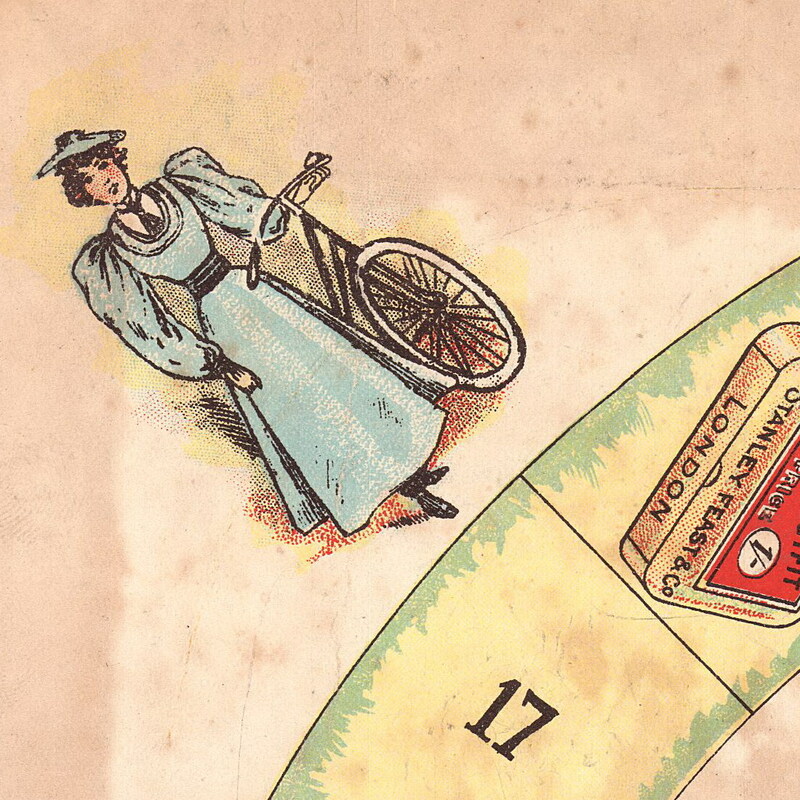 Object history note: The game show the adventures and mishaps which may befall cyclist. Lead pieces were probably made by Britains Ltd, a company which did produce flats for games as well as the hollows cast soldiers. 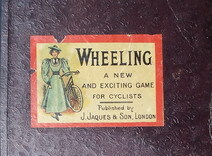 Descriptive line: Chromolithographed race game, Wheeling, made in England by John Jaques & Son between 1900 and 1910. "Wheeling (Tour de roue) édité par J. Jacques&Son au début du XXe siècle, est imprimé par chromolithographie. Ce jeu, qui comporte aussi des pions en plomb représentant des cyclistes, a comme sous-titre: "Jeu Nouveau et Excitant pour les Cyclistes". Il met en scène diverses aventures et mésaventures survenant à ces derniers. 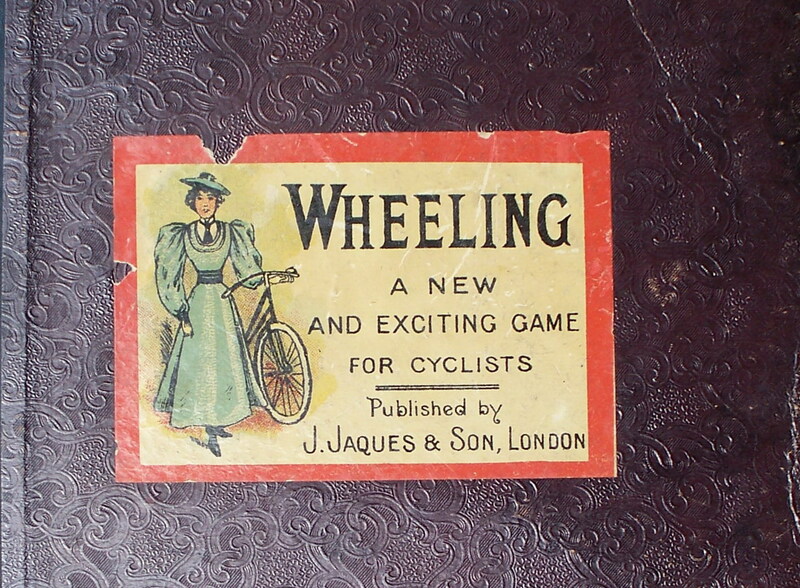 "Wheeling was published by J. Jacques&Son at the beginning of the 20th century and was printed by chromolithography. This game, which also has lead markers in the shape of cyclists, is subtitled "A New and Exciting Game for Cyclists. It shows many of the adventures and mishaps that befall bicycle riders. Wheeling. London: J. Jaques & Son, 102, Hatton Garden, E.C., [c. 1900]. Chromolithograph, 37 x 76 cm., on four-panel folding board, the reverse having a printed chess board and a halma board. 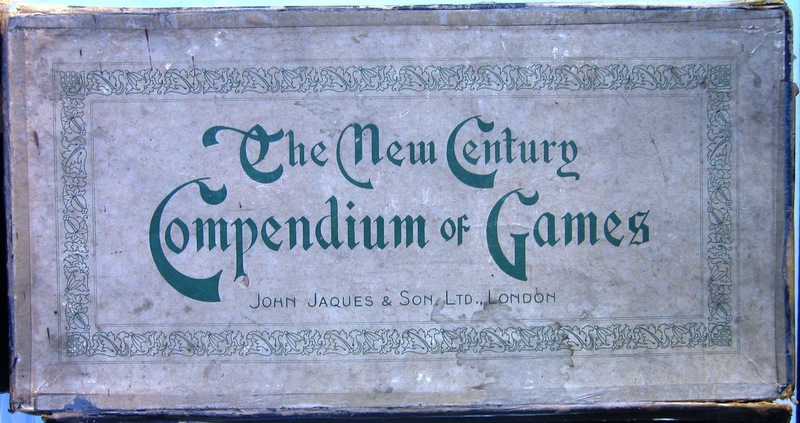 Jaques of London claims to be the oldest surviving manufacturer of games and sports goods in the world, tracing its origin to Thomas Jaques, recorded in 1795 as a manufacturer of goods in ivory, bone and hardwoods, including Tunbridge ware. 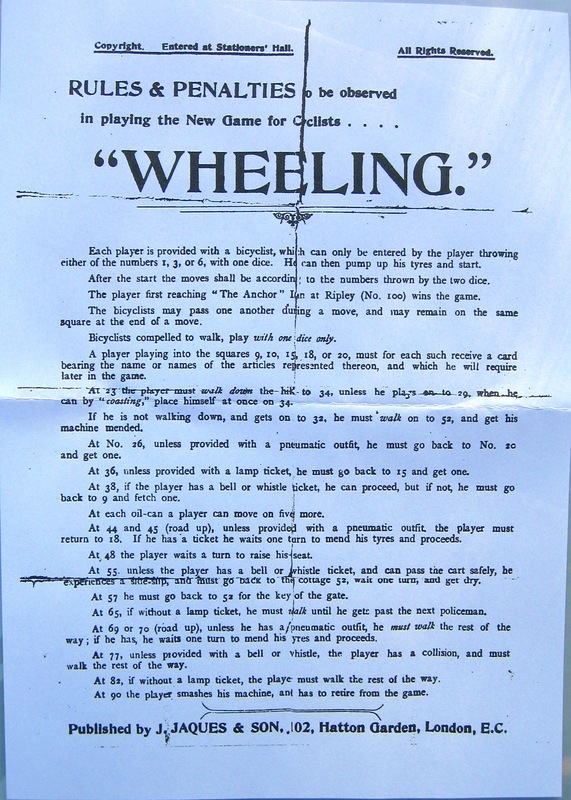 The copyright on this game was registered in 1896; several editions, all called Wheeling (an old name for cycling) were published up to the 1920s. This example is from the boxed set The New Century Compendium of Games. 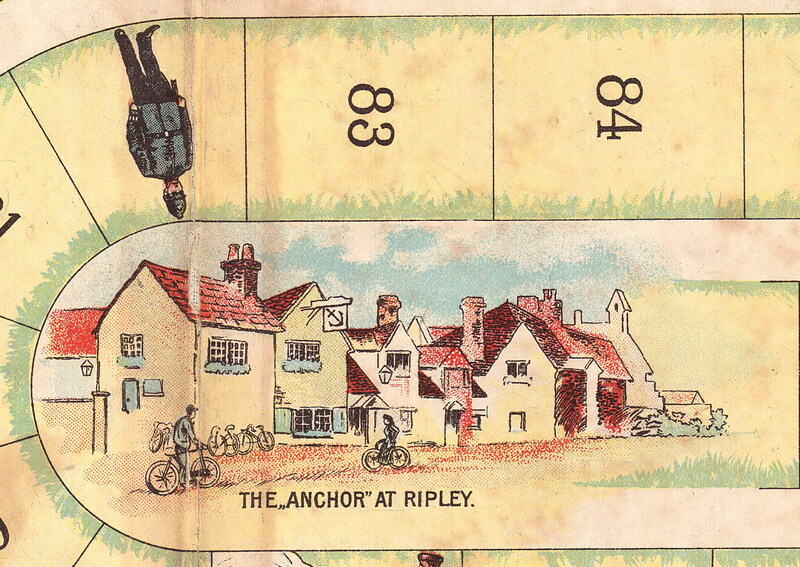 The goal is to reach The Anchor at space 100, which was (and still is) a public house at Ripley, a village in Surrey on the road to Portsmouth, 22 miles south west of London. The Anchor was a favorite destination for cyclists from London as it was a convenient and scenic ride. The player has to throw 1, 3 or 6 with one dice in order to start and “pump up his tyres”; thereafter, two dice are used. The game, though not obviously derived from Goose, is like it in having a regular sequence of favorable spaces, e.g., at each oil-can, a player can move on 5 more spaces. 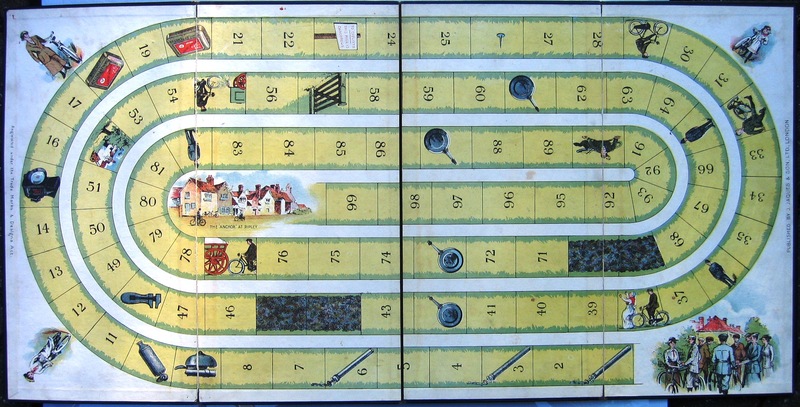 On the early part of the track are spaces that entitle the player to receive a ”ticket” (a printed card) for a bell or whistle; for a pneumatic outfit; or for a lamp. These tickets enable the player to avoid being penalized at later hazards, such as at space 26 (a sharp tack), and unless provided with a pneumatic outfit, the player must go back to 10 and get one. But one hazard is final: space 90, where the player smashes his machine and has to retire from the game. It is significant that, in order to make a good game, many of the structural features of Goose are present, though with different details. bibliografia: 1) GOODFELLOW, Caroline: "Jeux de société. Le guide du collectionneur des jeux de société depuis le XVIIIe siècle jusqu’à nos jours", (Edizione francese) Carrousel MS, 2001. 2) GOODFELLOW, Caroline: "A Collector's Guide to Games and Puzzles" Secaucus, New Jersey, Chartwell Books-London, Quintet Publishing Limited 1991. 3) Catalogo Mostra: “Le jeu de l’oie au musée du jouet”, Ville Poissy 2000. 3) SEVILLE, Adrian: "The Royal Game of the Goose four hundred years of printed Board Games". Catalogue of an Exhibition at the Grolier Club, February 23 - May 14, 2016. Throughout the 18th century and well into the 19th century, the size of the middle income group of merchants, solicitors, doctors and industrialists grew. Trade flourished and unknown areas were explored. The adventurers who were prepared to open shipping routes and establish trading agreements reaped rich financial rewards. This was an age of enlightenment, invention, innovation and scientific discovery. Games were a part of the industrial and social life of entire nations, reflecting changing ideas and ideals, particularly during periods of major upheaval. The upbringing of children within these middle class families changed dramatically. Education became essential, covering not only the `three Rs’, but sensible grounding in national and international affairs. National pride and achievements were stressed, as were faults. In general, everyone seemed to be looking outwards, to try to understand new concepts. We must, however, when viewing the games of this period, remember to set them against their own time rather than to evaluate them in the light of modern history, knowledge or ideals. The publishers of many of these games were already established producers of maps and books, many of which were aimed at children. The idea of creating an educational tool was, in a way, a novelty. The Game of Goose was already well known and it required few changes to create The Game of Human Life or the History of England. The games were well received by parents who appreciated the educational aspects, the children’s resulting enjoyment and possibly that the games could be played in relative peace and calm. The early games stressed learning through play, but this aspect was gradually dropped in favour of sheer enjoyment of play. However, not all games were that enjoyable despite the claims of their titles. Perhaps the whole logic of such games was summed up by John Harris in the introduction or Advertisement as it was called to his game Historical Pastimes which was published in 1810. “The utility and tendency of this Game must be obvious at first sight; for surely there cannot be a more agreeable study than History, and none more improving to Youth, than that which conveys to them, in a pleasing and comprehensive manner, the Events which have occurred in their own Country. The little prints, which are regularly numbered from 1 to 158, represent either Portraits of principal Personages who have signalised themselves as Kings, Statesmen, Churchmen, Generals, Poets etc., or some remarkable Occurrence in our Country. This will naturally excite a curiousity in the youthful mind; and that curiousity will be gratified in the short account of each reign subjoined. On the whole, the writer flatters himself, that the public approbation will convince him, that the hours he has devoted to the formation of this little Scheme, have not been spent in vain.” It is known from surviving records, paintings and artifacts that games of the period (and today) are played in a similar way to those of ancient civilisations in the near and far east. There are only a few basic methods of playing games and over the past 250 years many thousands of variations have been created. The basic methods of play come down to four types – race games, strategy games, table games and card games. Many were originally developed for adults and were later adapted for children. Today I will be discussing only board games developed in the United Kingdom. 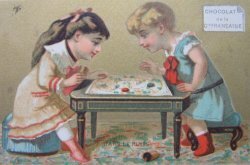 It was the race game which above all became the basis for the educational game of the late 18th century and first half of the 19th century. The aim was to win but it was played with an element of chance and normally gambling was included by the means of a central kitty or pool into which players placed an agreed number of counters. 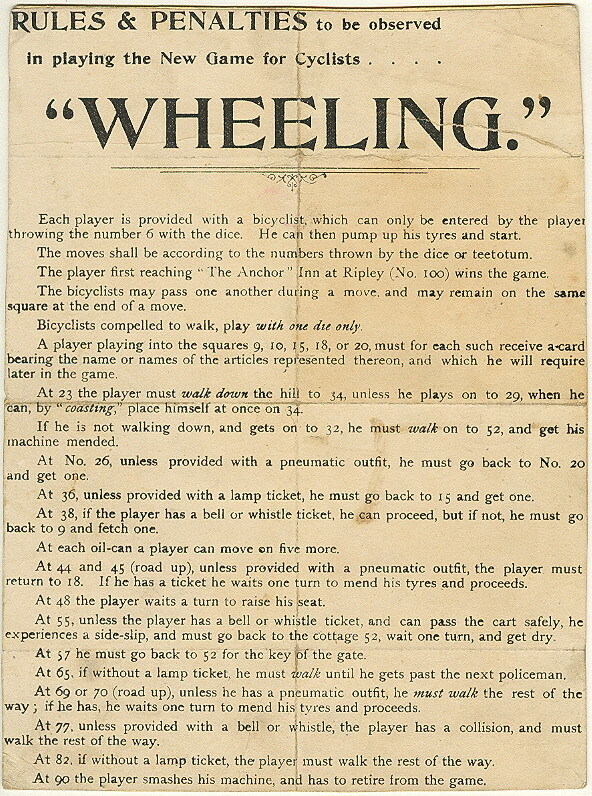 Throughout play, rewards were given and penalties paid; sometimes these were the receiving or forfeiting of counters and at other times forward or backward movement on the board itself, though not the removing of markers from the board unless there was a provision for retirement from the game. Why was this format produced for the wealth of educational games, including those teaching morals and behaviour, even though they retained the element of gambling and chance? Quite simply they were exciting to play. Astute publishers could use this characteristic to great advantage to encourage learning and reading skills. The Game of Goose is generally regarded as the prototype of the modern race game. Devised in Italy and taken from much early formats of games played in the Middle and Far East, it was first noted in England by John Wolfe in 1597 as “the Newe and Most Pleasant Game of the Goose”. There were usually 61 or 63 squares or compartments which stressed good and bad behaviour. Of these squares, a number were plain and a number decorated with either a scene or a goose. Landing on a goose was a good move and rewarded, often with the words “double his chance forward”, while if landing on a bad square such as the Ale House a double penalty was paid usually in the form of a counter to the pool and waiting until all others had taken a turn. There were also very severe penalties such as death or overthrowing the end of the game, which required the player to either start again or withdraw from the game completely. One of the earliest versions of this game was published about 1725 by John Bowls & Son and one of the latest during the 1980s. In general the format was a spiral or a flattened spiral but occasionally a new design was made, for example a one published by Richard Holmes Laurie, November 22, 1831. It shows a huge goose with three golden eggs set against a country scene. Variations of a theme were numerous. Laurie & Whittle, successors to Robert Sayers (they in turn were succeeded by Richard Holmes Laurie) continued to publish The Royal Pastime of Cupid Or Entertaining Game of The Snake which was based on the ancient Egyptian Game of the Snake, however, possibly in design only and not in rules. The reissuing of existing and popular games, often by successors to a business, was common. In many cases, no changes were made; in other case’s additions were included to update a game, particular ones on history or geography. All that a publisher needed to do was change the name and date of publication. Perhaps one of the best games of a goose was The New and Favourite Game of Mother Goose and The Golden Egg. It shows episodes and characters from the pantomime of the same title and includes Clown and Harlequin and places in London. It was published at the height of the career of Grimaldi the Clown, in September 1808, by John Wallis. Many of the first publishers of games were in fact cartographers and they quickly included the race game idea into game of Geography. The spiral format was not used; it was replaced by a map – of England and Wales, Scotland and Ireland (collectively or individually), of Europe or of the world. One of the first publishers was Robert Sayers, working from 53 Fleet Street. He published much for children including puzzles and other games. Having started in 1745, he was succeeded in 1794 by Laurie and Whittle. The ideas for geographical games are summed up in a statement in the booklet of Geographical Recreations or A Voyage around the Habitable Globe, 1809. “The game, consisting of 116 little prints of the most interesting objects in Geography, is designed to familiarise youth with the names and relative situations of places, together with the manners, customs and dresses of the different nations in the habitable globe; and, as curiousity will naturally be excited by the scenes which present themselves, and the observations likely to occur, it is presumed that these, with an occasional reference to the Synopsis herewith given, will prove a continual source of amusement to young people of both sexes, and will furnish such a fund of geographical knowledge, as may prove equally beneficial in reading and conversation.” This statement shows the high hopes that many publishers had for their games. The geographical ones could be boring to look at, they were simply maps, often surrounded with vast texts. One wonders now as we play these games, were the youths of both sexes excited, amused or entertained by any of them. Often the titles were more exciting than the games. There were The Tours of Europe, England and Wales by John Wallis, The Royal Geographical Amusement of The Safe and Expedious Traveller, The Royal Geographical Pastime. 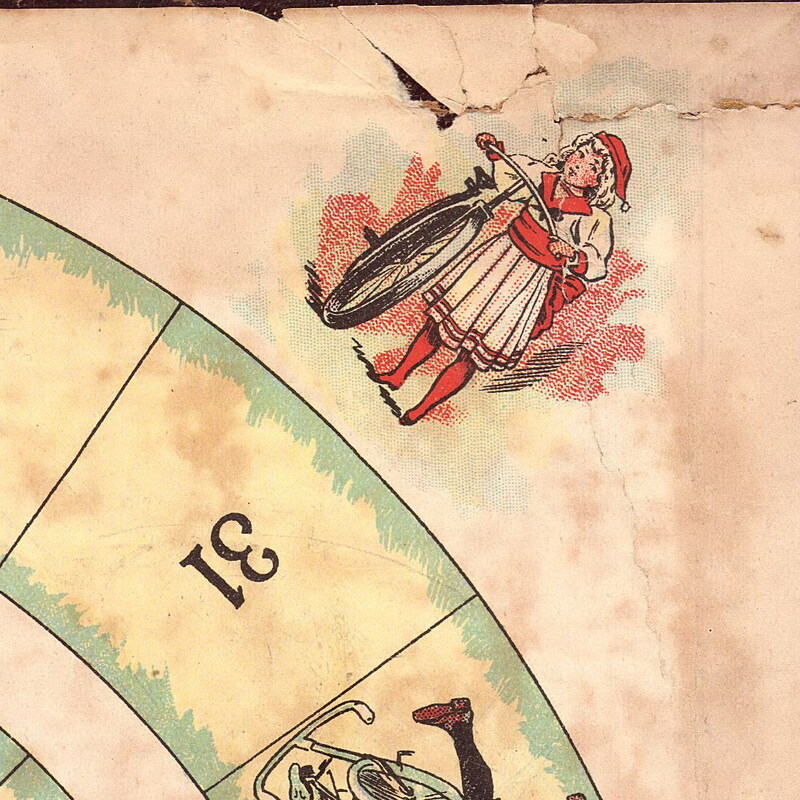 By the mid-19th century, many geographical games were devised on a pictorial note rather than simply maps. The historical and geographical games are quite illuminating when studying them for the context. To the modern reader, one may be surprised to see how well informed many of the comments could be. For example in A Tour Through The British Colonies and Foreign Possessions, published by John Betts, there is expressed disapproval in the selling of alcohol and weapons to North American Indians and the accepted fact that Sebastian Cabot rediscovered Newfoundland in 1496. William Darton, on the other hand, with his beautiful game The Noble Game of The Elephant and Castle, Or Travelling in Asia, 1822, seemed quite mystified by the strange ways and creatures found there for which there was no ‘rational’ explanation; this included a woolly mammoth. The games of geography essentially looked at the world from a British viewpoint but the publishers did acknowledge that other places and people might be interesting. The history based games, however, were altogether more inward looking and usually strictly based on events as they affected the British Isles. During the period under discussion, King George III was on the throne for most of the time, from 1760 to 1820. He and his son became the focal points for the games whether or not the events actually happened during their lifetimes. The second rather amazing fact is that for many of the history games, nothing happened before 1066 and the invasion of William the Conqueror. There are a few exceptions. One was The New Game of Universal History and Chronology, published in 1814 by John Wallis. This game starts with Adam and Eve, Anno Mundi 1. All the dates are given with great conviction, for example the Universal Deluge occurred in AM 1636. One now wonders how this knowledge was lost between then and today. The games of history had many squares, often more than 150, and of course by reducing the period of history covered more details could be included. The games were often re-issued and reworked with changes being added in or adapted, especially with the death of the kings. George the Third reigned for so long, that a game was published by John Harris to celebrate his Jubilee in 1810. The squares showed events of his lifetime and the text in the accompanying booklet was very flowery when in praise of the king but was equally robust when describing some of the more disagreeable events. Included also were scientific and geographical discoveries. Ten years later John Harris reworked The Jubilee as The Sun of Brunswick to celebrate the new king, George IV. The last 20 odd compartments were redone to include the deaths of Queen Charlotte, wife of George III, Charlotte Augusta the daughter of George IV, who was in a fact heir to the throne and known as Princess of Wales, and of George III himself. By the 1840s, Queen Victoria was on the throne and one of the most important new inventions was the railway, both were added to reissue games. Gradually both history and geography-based games were replaced by other forms of games and of course, methods of learning. But these subjects were not the only ones to be treated in this way. Mathematics, natural history and languages were also subjected to the race game format though generally these games were not as attractive to look at. However, if played correctly, they were enjoyable ways of learning. An Arithmetical Pastime was published in 1791 by C. Taylor. It had 100 circles, some of which contained illustrations while others had directions and forfeits to be paid. The forfeits were repeating tables, some of which were obvious such as the times tables, others were less so, for example the wine measures. Other tables are not now used – the avoirdupois, for example, measured pounds and ounces. If a player could not meet the forfeit, he had the choice of missing turns or moving backwards. A later version, with the same title, had quite different rules and used two teetotums for the moves and to learn the mathematical disciplines. The players had to subtract, multiply or divide the two numbers given by the teetotums and the result formed the move. Used to accompany the game was a set of verses to be read out and a list of further rewards or forfeits. This version was the ultimate teacher as it taught everything - morals, history, geography and arithmetic. inked to mathematical games were those of astronomy. Science in Sport or The Pleasures of Astronomy, published 1804 by John Wallis, had 35 compartments with the portraits of astronomers and representations of astronomical phenomena. At the time nine planets and their movements around the sun were known, however, these were added to with fictional representations, for example The Man in the Moon. Often behaviour traits, The Studious Boy and the Blockhead, signs of the zodiac, comets, rainbows and even known astrologers were shown. The Circle of Knowledge, published about 1845 by John Passmore, included the zodiac around the central compartment. Unlike many games of the time, it was arranged in four concentric circles. As well as the zodiac and the four cardinal compass points, Europe, Asia, America and Africa were shown, together with the four seasons, the four houses of the zodiac and the four sciences - electricity, chemistry, optics and astronomy. The illustrations too were unusual, for example fire was illustrated by a volcano, a burning farm and a pit explosion while optics were shown as a giant telescope, a magic lantern show and the perspective of a tunnel. One of the best games of natural history was William Darton’s 1820 version of British and Foreign Animals. The subtitle again gave graphic details about the aims of the publisher with “A New Game, Moral, Instructive and Amusing, designed to allure the Minds of Youth to an Acquaintance with the Wonders of Nature.” Both domestic and wild animals were included, even the Australian kangaroo. A companion game published by Darton in 1822 had the wonderful title The Delicious Game of The Fruit Basket or The Novel and Elegant Game of The Basket of Fruit. Sadly only the design and title were delicious as the game dwelt mainly on penitentiaries and trial by jury, the Royal Academy, hospitals, national schools and the School for the Blind, sciences and religion. Both games while following the principles of rewards and forfeits were very much a teaching tool. William Darton’s games seemed to have a sombre side as many were very moral and rather disagreeable in tone yet beautifully executed. He later produced one which should have cheered everyone up, called A Voyage of Discovery or The Five Navigators, 1836. However, it dealt with the dangers and incidents likely to befall sailors. We have touched on the games teaching history, geography and so on but the final main group was that of morals; these games were extended forms of the original Game of the Goose. Within many of the previously mentioned games, morals were included, however, the publishers devised many more which were very strict. Often they had good titles and possibly the best was The New Game of Virtue Rewarded and Vice Punished for The Amusement of Youth of Both Sexes, published in 1820 by William Darton. A generation earlier, a similar subtitle was “Designed for the Amusement of Youth of Both Sexes and Calculated to Inspire their Minds with an Abhorrence of Vice and a Love of Virtue.” Taken from The New Game of Emulation, published by John Harris in 1804, this game actually showed many images a child would actually come across, a shepherd with his flock, a church, school, even a rocking horse while the almost cryptic words “cheerfully exert themselves to obtain an honorary prize” while being “perfectly aware of the consequences of disgrace and naturally dread it” rather deadened the pleasing illustrations. Two methods of teaching morals or behaviour were produced, though both used the same games format. One method was based on the passage of life from infancy to old age and death and showed the temptations one might meet along the way. These tended to have straight formal titles such as The Game of Human Life and more often than not were based on the male life to the exclusion of females. 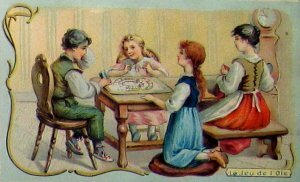 However, the games were not restricted to boys playing them, as the subtitle to The Game of Human Life states “...most Agreeable and Rational Recreation ever Invented for Youth of Both Sexes.” Parents were encouraged to instruct their children on each of the characters, usually 84, with “a few moral and judicious observations... and contrast the happiness of a virtuous and well spent life with the fatal consequences arising from vicious and immoral pursuits”. Most of the characters have the same meanings today although some of the pursuits would not now draw penalties, for example The Romance Writer must pay two and move back to the Mischievous Child and the Dramatist must pay four and begin again. The Tragic Author has the harshest as he advances to the Immortal Man and dies but to compensate him he actually wins the pool or kitty by finishing first. The game quoted was published in 1790 by John Wallis and Elizabeth Newbery. 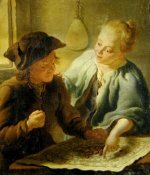 (While we are discussing only English games of this period, there are some very fine French and German examples of The Game of Human Life, often far more intricate in design.) The second method, developed slightly later, was stricter and based on the fundamental principles that if you behave properly all bodes well, but if you slip from the straight and narrow the penalties are severe. These titles were much more lucid with The Cottage of Content or Right Road and Wrong Ways, The Journey, The Mansion of Bliss and The Mansion of Happiness. (This latter one is also the title of one of the first American board games, published by W & S B Ives in 1843.) Penalties were paid for often routine bad traits – straying, boasting, wasting time, idleness, self-indolence, obstinacy, ignorance, pride, conceit and forgetfulness; other traits were considered very bad - theft, lying, drunkenness, cheating. In most of the games there were more bad than good traits – recollection, repentance, patience, kindness, exertion and diligence. 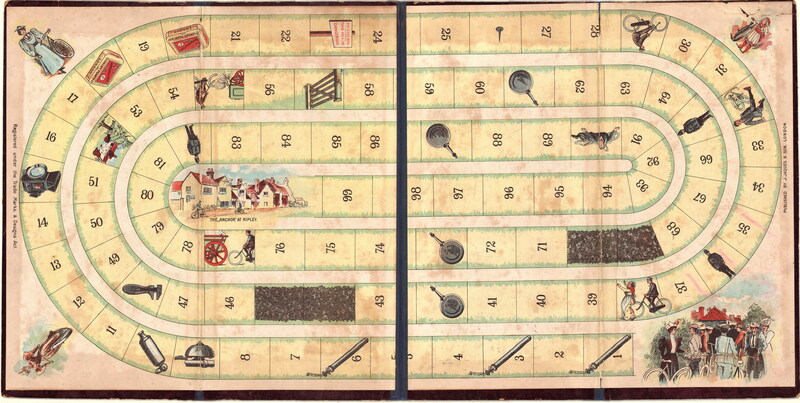 Snakes & Ladders was the game which took over the teaching of morals, and it was a version of a game introduced from India. Like the earlier versions, there were more snakes, the baddies, than ladders, generally 12 to 8. By the middle of the 19th century new processes were being introduced, lithography had been developed which was cheaper than the engraving and etching processes, even though the publishers had been one of the first groups to involve themselves in new technology – the use of static steam presses instead of hand operated ones. Many of the original group had died. The men and women who developed these early teaching games seemed to be inspired and that inspiration seemed to die with them. New publishers, new methods of production, new methods of teaching and new games formats changed the look of the board games and the very reasons for their existence. As we study them today, however, the games remain excellent teaching tools. We learn from these games the history and social life of the people, what they felt was important and how they regarded themselves in relationship to the rest of the world and other cultures. Publishers Mentioned John Wallis, with sons John and Edward; one of the most prolific publishers of games and dissected puzzles between 1775 and 1847. Also worked with John Harris and Elizabeth Newbery. Elizabeth Newbery, part of the leading publishing family of children’s literature during the 18th century; John Harris managed her establishment. Worked with John Wallis John Harris, took over Elizabeth Newbery’s business in 1801 and worked until it was sold in 1843. Robert Sayer, one of the earliest publishers of children’s games, 1745-1794. Laurie & Whittle, Robert Laurie and James Whittle; acquired the business of Robert Sayer in 1794. Richard Holmes Laurie succeeded Robert on his death in 1812 and James Whittle on his death in 1818. Also worked with other publishers including William Darton. William Darton, established 1787 and under went many name changes depending on the partners and sons. The William referred to here was the son who opened his own establishment in 1804. John Betts, leading 19th century publisher between 1827 and 1874. John Passmore, published from 1840 to 1869.